Crewton Ramone Using Base Ten Blocks In The Classroom. Here is a second post about how easy it is to incorporate base ten blocks into your classroom situation. Here is the other post I did called Crewton Ramone In the Classroom. This is also great for stoking their imaginations as they tell stories about the ruins of Egypt and Great MATH Pyramids. 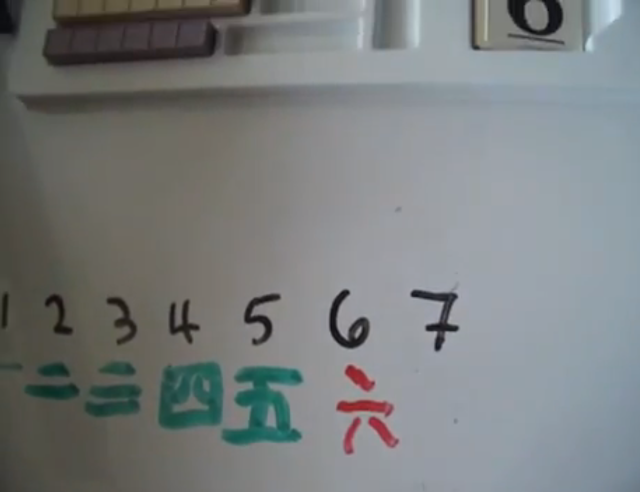 I've gotten into contentious debates about whether little kids can do math like this. What is so hard about it? They use their ability to discover SAME on both sides to discover x and then they have to do some more thinking to discover what the number is that is disguised on either side. You start off easy and work your way up...in both of the cases I cover here some students got the answers instantly. I will be the first to admit that it CAN get loud and out of control if you let it. Here some of the class is gone because they have remedial reading, but groups of four per combo kit works well and there could easily have been all 24 of them. I never really got any of the lessons on Pythagorean theorem I did on vid but factoring, fractions and percents are all easy to do with manipulatives. Here is an additional page on how to teach addition. (Get it additional!! C'mon--that's funny right there.) You could spend quite a bit of time there if you follow all the links on that page. At the same time you introduce those concepts you play and build addends learn about integers and subtraction and practice multiplication so they can see the whole picture not just tiny compartmentalized parts. 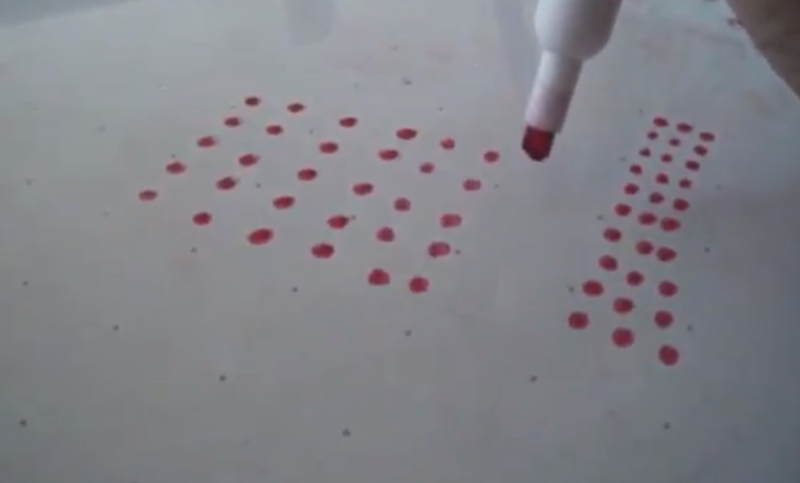 This one shows them being creative, developing their fine motor skills and more. They not only built addends they had to work at getting the sevens fence to work using the posts...which are addends for 5...younger students would have a hard time making that fence work...these activities are great for preschool thru 3rd grade although older kids like to play too and some who never mastered their addends could also benefit. Building and playing gives them a positive math experience. They are in second grade. It shouldn't be work. It should be fun. These kids looked forward to Mondays with Crewton Ramone. They go home and tell their parents about what they did and the parents are amazed at their little second graders explaining factoring or Pythagorean theorem to them, I was at a birthday party and basically got mobbed by the parents there who were amazed that I was the math guy. They thanked me for teaching their kids math beyond adding and subtracting which is about the extent of the accepted 2nd grade curriculum... Adding subtracting a little measurement money and time telling. This one can get out of hand because if they aren't careful the towers crash and there is a lot of excitement. Note that the point is to build addends NOT to build towers. 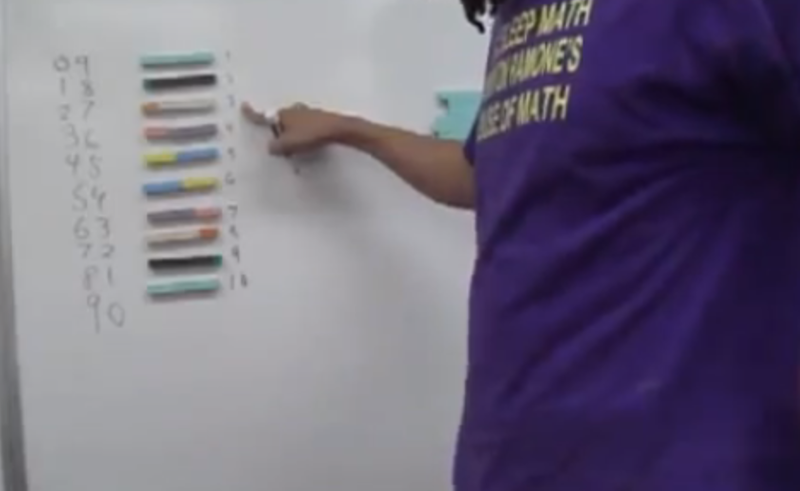 I have seen teachers have them build using all the same blocks instead of the combinations...which defeats the purpose. Also you can count each level by the 4 or five blocks they used to get some skip counting in...in other words count the all the 7's on the 7 level...7, 14, 21, 28, 35...all the nines on the nines level etc just to get the patterns for the first few in. 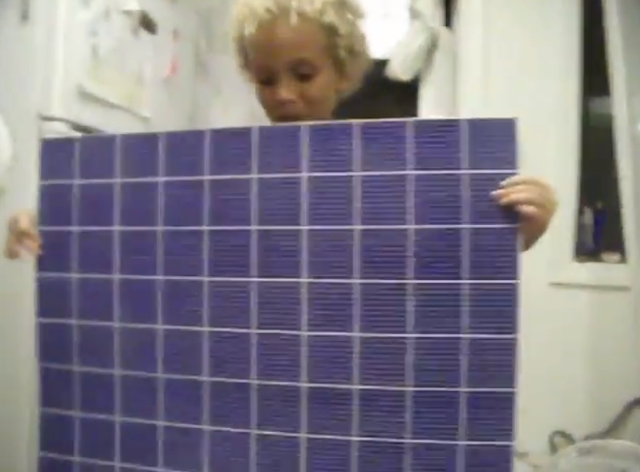 For older kids (third or fourth graders) I make them build it and then tell me how many units they used...they have to do a lot of counting. That means count every block...including the hundreds...so lessee that's 100 plus 5 tens, plus another 100 plus 6 nines plus another hundred etc...some kids count all the hundreds then the pillars...no matter how they do t it's a great exercise in addition and multiplication. 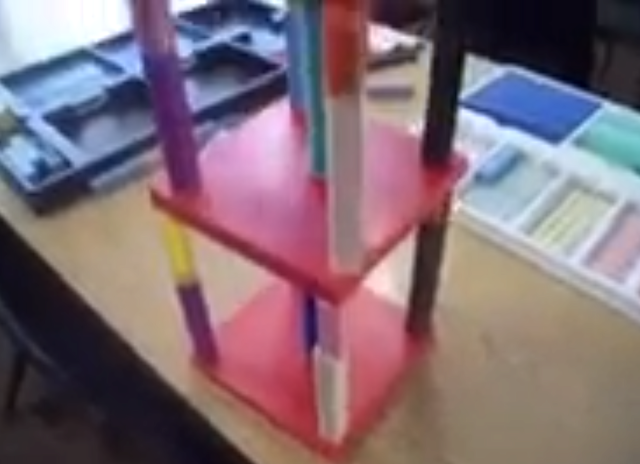 Here is another fun exercise making a cube (it takes two top trays however) and I didn't make this vid in the classroom but at home with three home schoolers but there's nothing stopping you from doing in the classroom if you have the blocks. 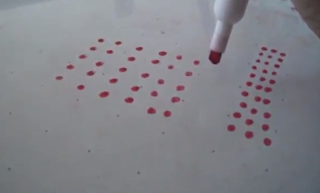 I did this with the first graders but never got it on vid. I made them line up and each kid built a combination and they went around and around their tables as fast as they could trying to build theirs faster than the other teams. 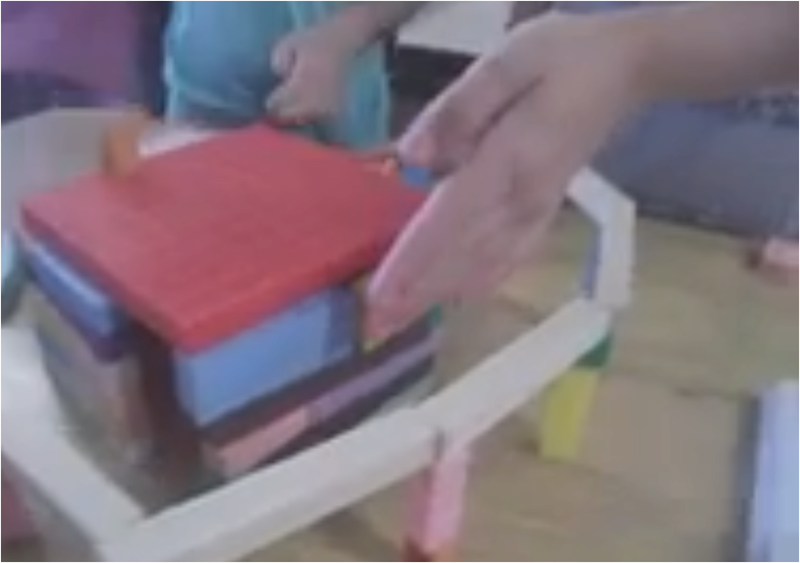 A teacher could help keep the blocks straight and from falling down as it gets ten high. When you are done you can talk about cubes and notation if you want. All in all it's EASY to use blocks in the classroom. You will find that just by playing they learn their addends and a lot more all on their own. Some direction from you can help but it's more fun and effective than worksheets and book work, the students learn more faster and you will earn a reputation as a good teacher and a fun teacher that students look forward to coming to rather than not. 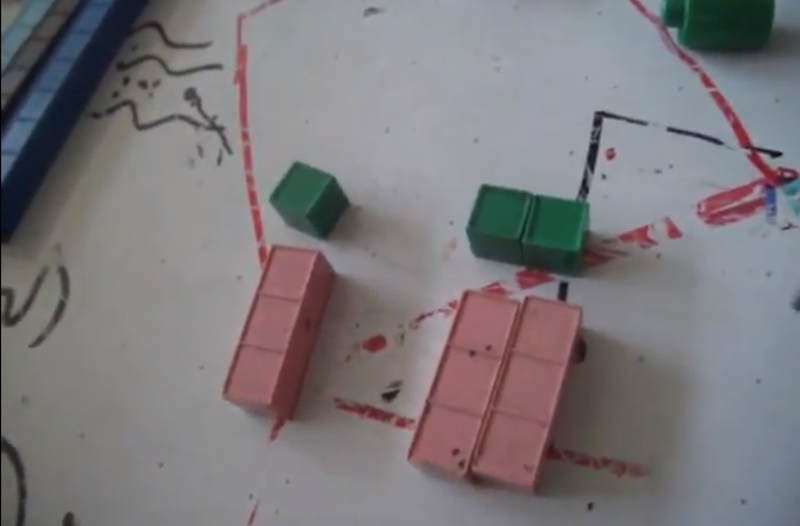 Here is a page at the house of math that has a little more about using base ten blocks in the classroom and an instructional video with a million dollar idea in it...it basically links back to this blog post and the other one but it also contains a little more info and a couple of other vids to help you. 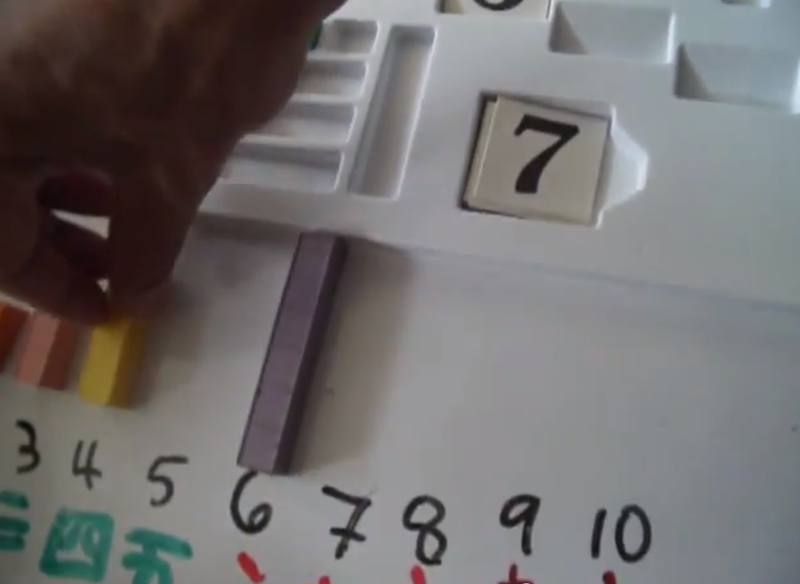 People are always amazed that somehow children learn math through play. 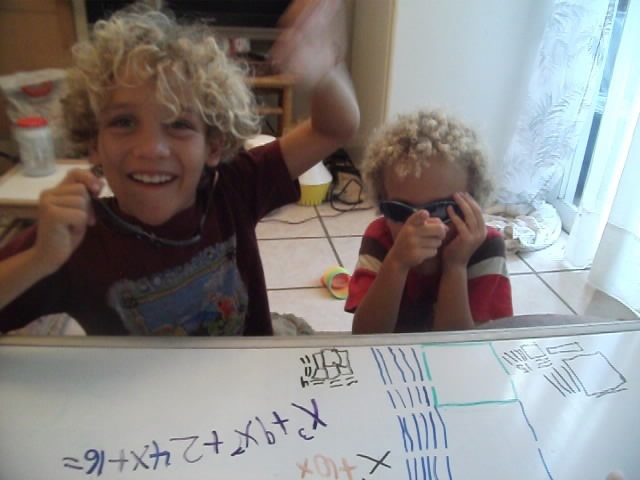 This is because when they remember math there probably wasn't much play or fun associated with it. In fact a lot of people would rather not remember their math experiences at all because they often were so bad. How about you break this cycle with your kids and give them fun math experiences instead, and happy memories. 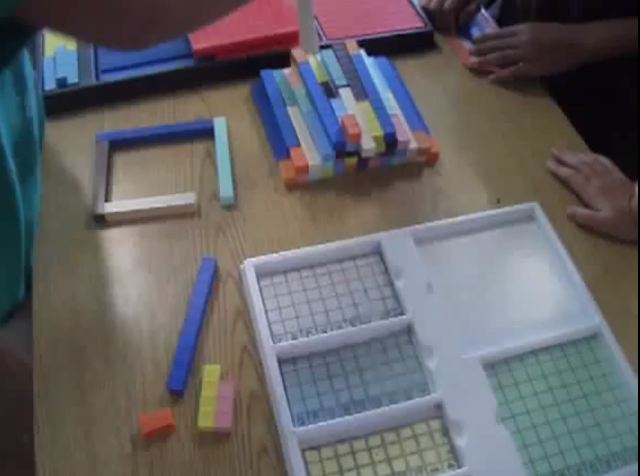 Use math manipulatives and play and have some fun learning. 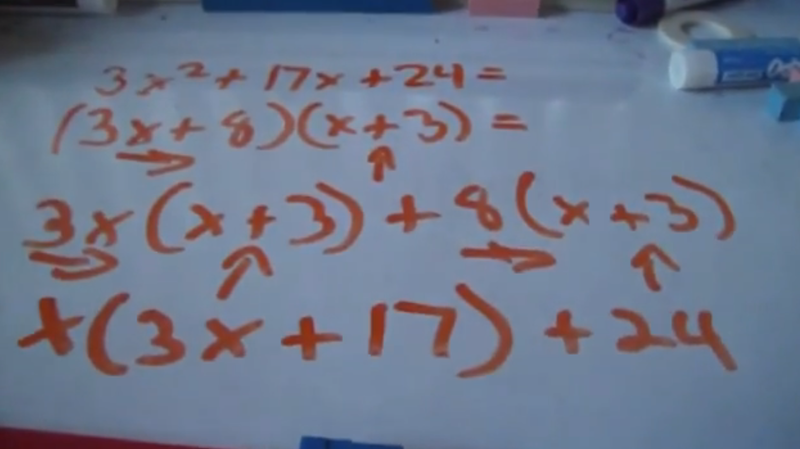 The idea is to give them an algorithm to solve problems like 7 + 8, but before we do that we have to understand that numbers are made up of other numbers and in order to do that we need to build them starting usually with 10. It's like stairs dad! And the two falling off was all kinds of funny. 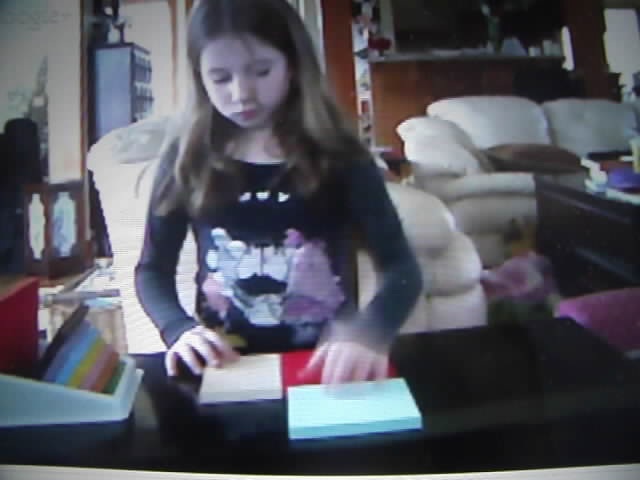 This little girl is building tens we built other numbers and counted pairs of numbers too but we spent a lot of time on ten and nines. I'd say this qualifies as quality time with dad. We didn't attempt to write anything at all. Just built and talked about the numbers. 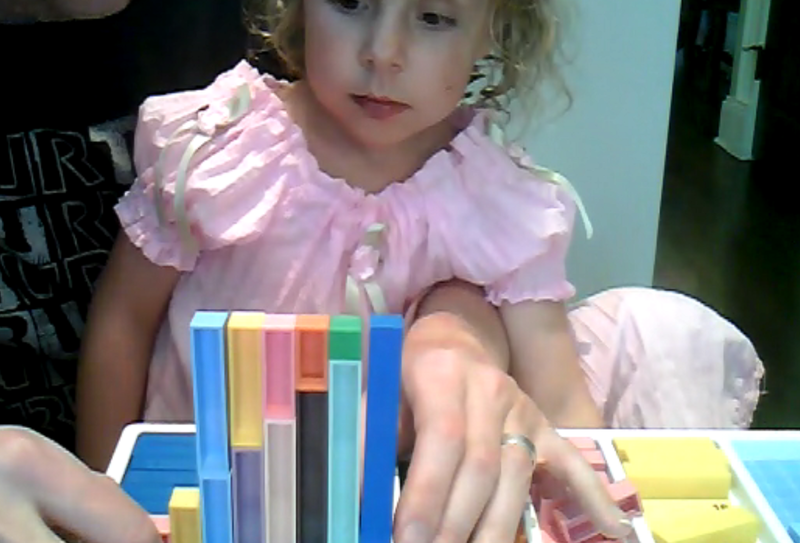 Using base ten blocks makes it visually obvious to the child and later when they do see symbols the symbols make sense. She gets a full sensory experience using BOTH hands, hearing and seeing what we are learning as we go...whether she is a kinesthetic learner, a visual or auditory learner doesn't really matter...we cover all the bases. Further, even if she was dyslexic it wouldn't matter there are no symbols to confuse and the base ten blocks level that playing field too. She can see what she is doing and hear her father and I tell her that nine and one is the same as ten. People often think that in order for them to learn math they have to write it down or they aren't really learning it. Really? Do you get little babies to write words down when you are teaching them English? Or do you just talk to them and they pick up the language that way and later maybe when they are 4 or 5 put a crayon in their hand and let them start learning to write letters...but just because they have a hard time writing their letters doesn't mean they can't speak English. Apply the same thinking and reasoning to the mathematics which is also a language. You start with very basic concepts like numbers are made up of other numbers and they all want to be ten. You can build tens up and down or you can build them flat or you can make walls. It doesn't matter. If you build sky scrapers they get a good sense of ordination...that is 2 is 1 more than 1 and 3 is 2 + 1 and so on all the way to ten...here she started with 10 first and worked we our way down. There is no wrong way to play you don't have to start at one. 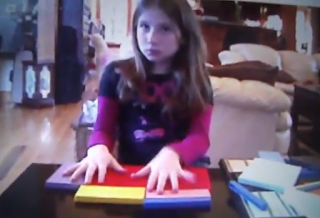 She built NINES and TENS. Building nines is fun and easy. You don't have to go in order just play. She was having fun building this ten wall on her own. No need to tell her to go in oder starting with nine and one. 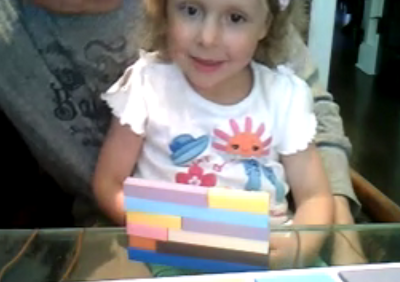 After a bit we asked her if she could use different combinations but at this point just building the wall that high without knocking it over was a big deal. Fine motor skills being developed...it's more than just math going here. You can see these shots were taken on two different days about a week apart. In that amount of time at this age it's basically new again. But the repetition isn't lost and neither are the concepts. It's in there. The sub conscious mind stores everything. Later we can bring it out again. To educate. To draw fourth....not to cram in. AND when we draw it fourth it will come with pleasant associations making everything that much easier. Basically we are working on addends here which will make addition much easier later on. I have pages on addends and addition and more games and activities you can play over at my website Crewton Ramone's House of Math. Join us on FaceBook. 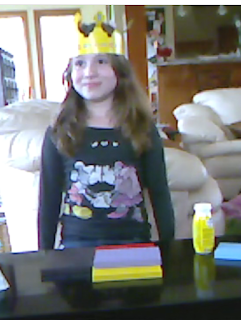 And spend some time watching videos on youtube for more info on how to PLAY math. 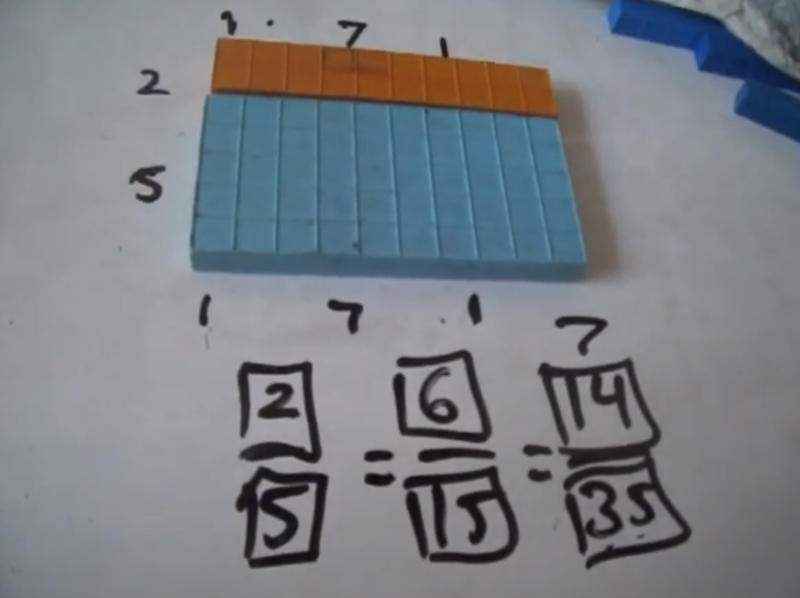 Here is another video showing how you use base ten blocks to bring home the basic concepts of addition and multiplication. A very simple concept for very young students to grasp is numbers are made out of other numbers. You need to talk about addends...they get it when you tell them you can make a 5 out of a 3 and a 2. There are 45 addends but rather than doing the same thing over and over again for a whole year, addition in first grade for example, using worksheets and flashcards and drills...why not play and have fun and do many different activities that teach the same thing. 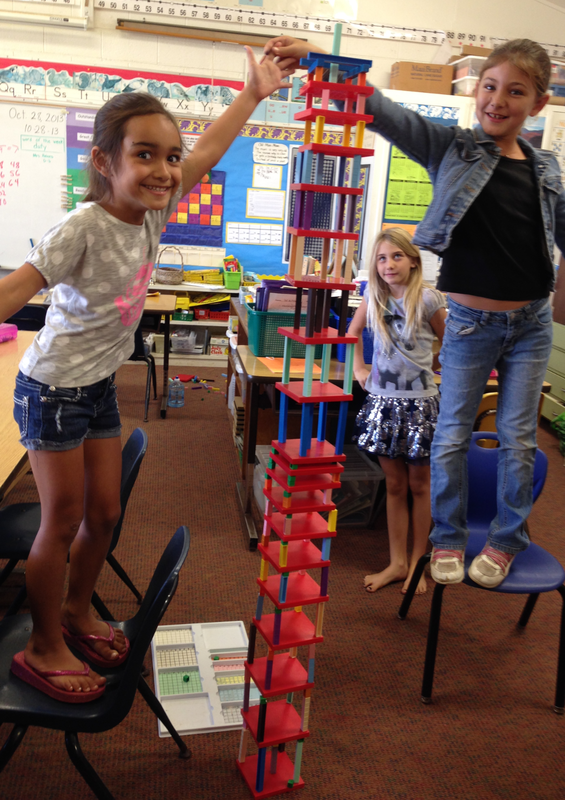 Building towers, pyramids, walls and math towns are all activities that teach addends. (Search crewton ramone pyramids or crewton ramone addition) Variety is the spice of life. You teach addends, multiplication and the algebra is just along for the ride. 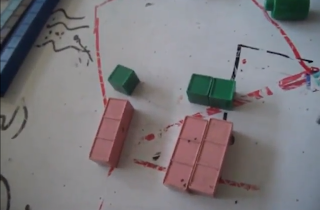 Here is another slightly more advanced way to teach three things at once using base ten blocks. 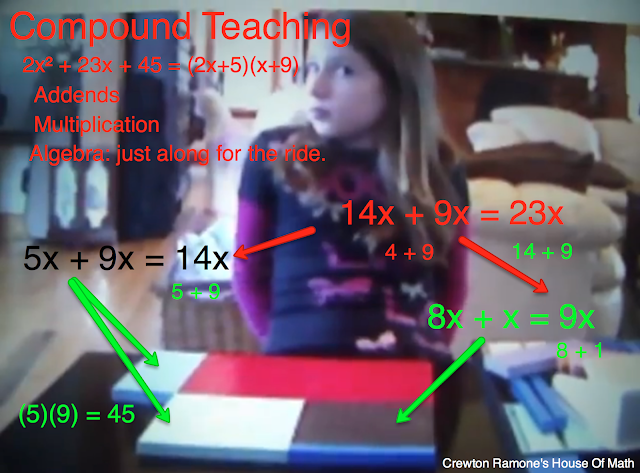 You teach addends, multiplication and "the algebra is just along for the ride." Before you do this you get very comfortable with ONE x² before you add two or three. And you might check out this page that shows you how to present the basic concepts of addition and subtraction using manipulatives too. While you are using two of them you can really bring home the addends if you have a set of multiple tens. If you only have single blue (or whatever color you have) bars, not so much; BUT you can still get addends done if all you have is single bars just name the groups of x and add those. As an added bonus you are factoring polynomials. I have discovered that a lot of older students have trouble with algebra because they haven't ever mastered their addends and they don't have their multiplication tables mastered either...yet they passed math several years in a row and find themselves in high school. Older students can take the time to draw the problems and write down the symbols. Younger students need speed and repetition so they don't get bored...and taking the time to write it all down slows things down too much...so we just talk about it...this also will come in handy later when you find they can do a lot of math in their heads. No Blocks. No pencil and paper either. Other comments about this are regarding "mindset". Using algebra to teach basic math works well on all manner of students from various age groups because it changes their minds about math being hard. It's easy and even fun. Once they think it's easy: IT IS. If they think it's hard, math is much more difficult. 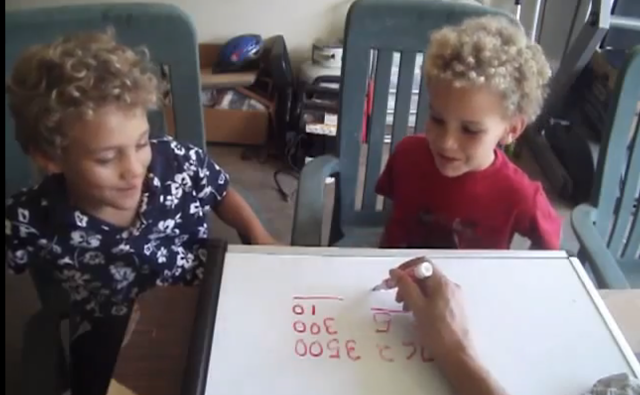 The next idea is working with older students who need to master multiplication and all 45 addends using traditional methods can make them feel stupid or inferior because they know they are doing work that is "beneath their level" or that younger kids do...this can be damaging to their self esteem and further turn them off to math. Recently a parent asked me what I thought of the math tutoring a public school had after school..."more math the same way they didn't get the first time. SO lets do it over again and perhaps they will get it this time." Even if they do they will have less than positive associations with math. If you use algebra and it's fun and easy to start and stays easy, they have fun feel smart because they are doing algebra which they know in kid culture is supposed to be hard AND they get the practice they need to enhance their skill sets in addition and multiplication. Plus playing with base ten blocks is fun--they look like toys. They are toys. Powerful toys that teach math. Toys that make math child's play. In your hands they are powerful tools when used correctly. They MUST get their hands on the blocks. This way you reach all learning styles and oddly enough several universities have recently made the discovery that the more senses you use the better and easier learning is...and the more learning takes place. Also note BOTH hands make for a whole brain activity. This is why I have success with so many different students. The only way to learn math is to do math, have fun while you're at it. I found early on as a salesman for this method that sales sky rocketed when we had enough kits for everybody in the room and everybody got their hands on the blocks...they understood it, they saw it made it easy they got a kit. Otherwise it was just more math. Also athletes and other learners that are more kinesthetic excel using this method, and this is also why we do so well with special need learners. 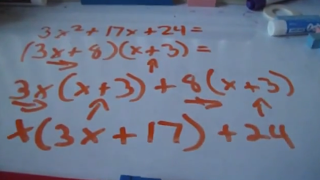 I have made many posts about using algebra to teach basic operations. See the links below. 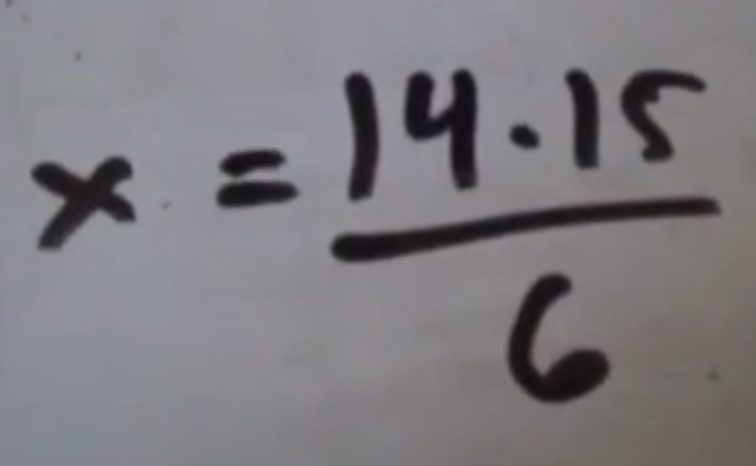 You can also use fractions to teach addends and multiplication but that's another post and another video. The previous post Algebra With Base Ten Blocks For Addends And Multiplication this could be considered part 1 and the one you are reading now part 2. 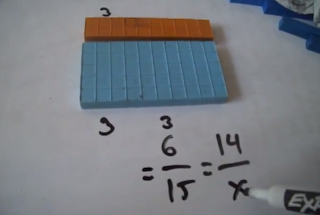 Use base ten blocks to explain the distributive property. Shortly there will be another post with Commander Colby showing how to use algebra for remedial math without damaging the child's self esteem or making them feel stupid or like they are behind. Trying to get people to understand that you can use algebra to teach addends and multiplication can be a little frustrating. People (including teachers) are so stuck with the rigid and foolish way we have structured mathematics instruction in the USA that using algebra to teach addition or subtraction or fractions to teach multiplication are practically inconceivable. Compound teaching is; however, a very effective method for teaching math and base ten blocks definitely help. 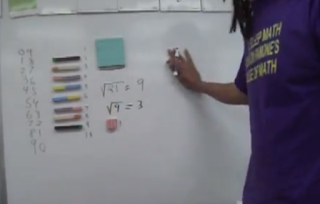 This is video from an actual tutoring session. The little girl has all manner of distractions and yet we cover more math in an hour than she'll get in several days at school. And it's fun. Rather than spending days and days doing the same multiplication problems amd filling out works sheets, why not use base ten blocks and do lots of problems quickly. Remember the brain likes to work quickly. And the more impression it get the more likely the information is to be transferred from short term to mid term memory and finally into long term memory and with more impressions the info is available for instant recall. It is more likely to get there if you are having fun than if you are drilling and it's drudgery. The child is engaged, the brain is engaged learning is taking place. By the time this video started we'd been playing for a good 10 or 15 minutes. 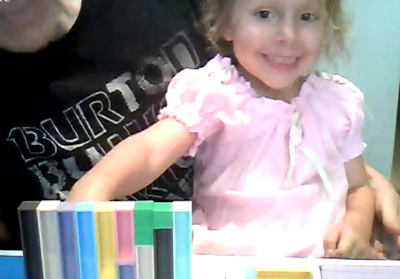 Also it was self directed: she could use any two multi ten blocks she wanted, (these are base ten blocks that make building super fast because we don't have fool with getting out tens or x one at a time). Also note you still have to work with them to get them to add two numbers instead of counting each block, and the more they do it, the faster they get. 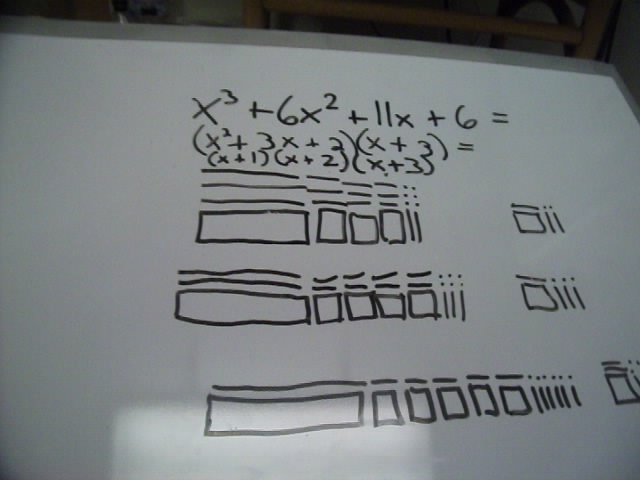 Same with the multiplication. All it takes is pratice and it's kind of fun to have the control of making up your own problems. 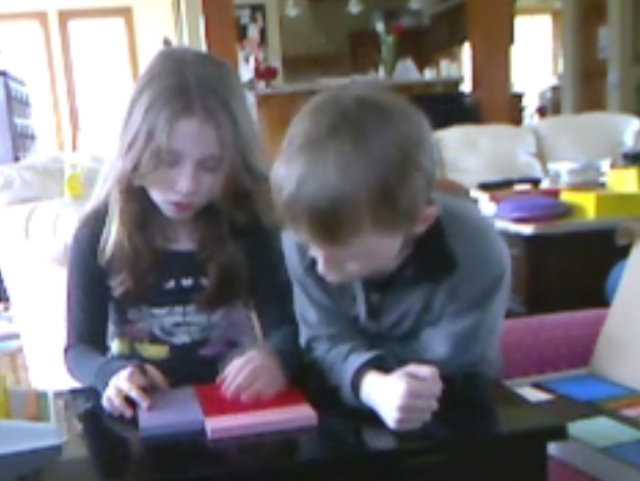 She showed her little brother how easy it was to do algebra..."all you do is count," she says triumphantly. With drill work and work sheets the brain eventually shuts down and it's boring you may even see them begin to yawn. Be careful with worksheets. 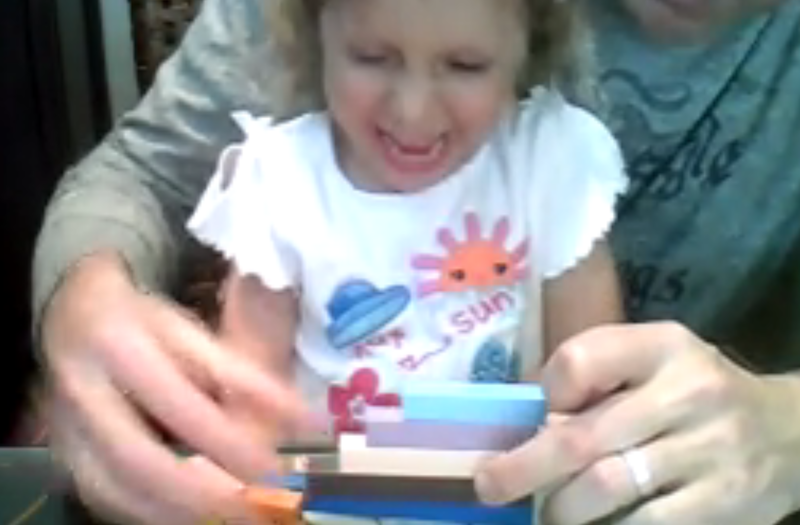 Using base ten blocks engages all the senses. It's fun an you get more work done in less time. They learn more, faster. When you can do your math and you get it, it's fun and it makes you feel good because learning is fun and sets off all manner of endorphins in the brain. Declaring yourself queen of math never hurt anything anyway. I am especially aware of little girls having their self esteem damaged when they fail at math. The psychology of the female is to take it personally, more so than boys as it was explained to me by a person who had a degree in the psychology of mathematics, little girls tend to think something is wrong with them when they don't get it, little boys tend to think there is something wrong with you if they don't get it. This is an over simplification and generalization but it is backed up with direct observation and anecdotal evidence during my travels. 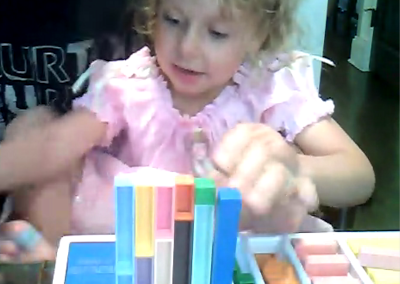 You can play want to be a ten with the multi ten blocks...only it's actually, "want to be a hundred." 3 tens wants 7 tens...etc...7 ten and 6 tens is 13 tens...same blocks we are playing in algebra so 7x plus 6x is 13x...simple. Here is another blogpost Algebra For Addends and Multiplication. You can also use algebra to teach remedial math, I have a student who has a hard time with multiplication and subtractions and fractions and...so we do algebra and then evaluate the polynomials for various numbers. This "tricks" him into doing his remedial work while he learns algebra and he doesn't realize we are doing stuff he should have learned already because he likes algebra, it makes him feel smart. Thus preserving his self esteem AND getting the work and practice done that he needs. The point is you can use algebra for teaching right along side, concurrently with, so called simple, basic lessons on addition, addends and multiplication. and if you liked this page which is basically Algebra for little kids you should also like Trig For Little Kids too.